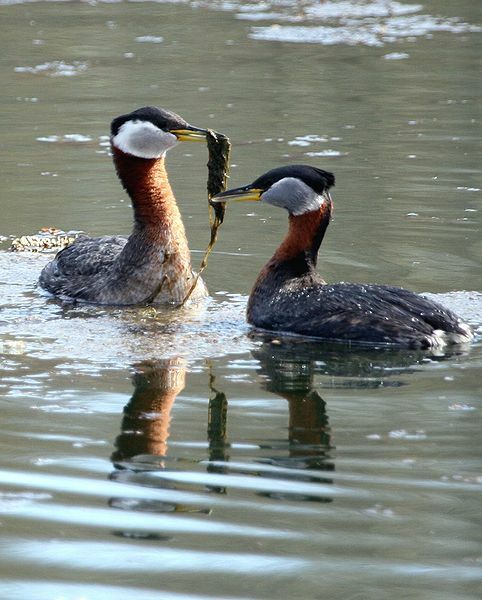 BPBO’s two Red-necked Grebe (RNGR) data gatherers have been at it again this fall. For the second consecutive year, Don Douma and Bill Hansen, residents of Dyers Bay, went out many days this fall to make observations of the waterfowl on Dyers Bay. 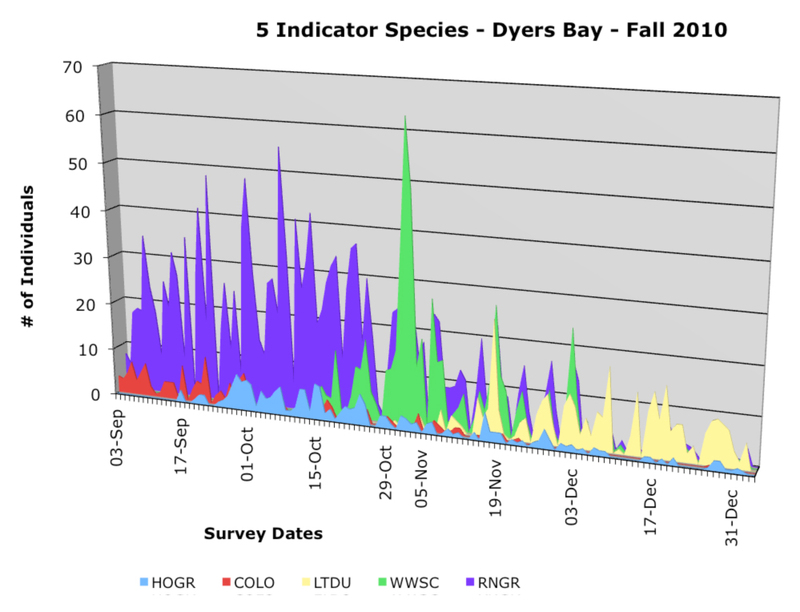 Observations were made on a total of 112 days, beginning September 03, 2010 and concluding on January 02, 2011, including detailed weather and lake conditions as well as the number of waterfowl present. Don made observations in the morning and Bill observed in the afternoon. On 58 days, observations were made in both the morning and afternoon, with the data suggesting some interesting patterns in the movement of the grebes. 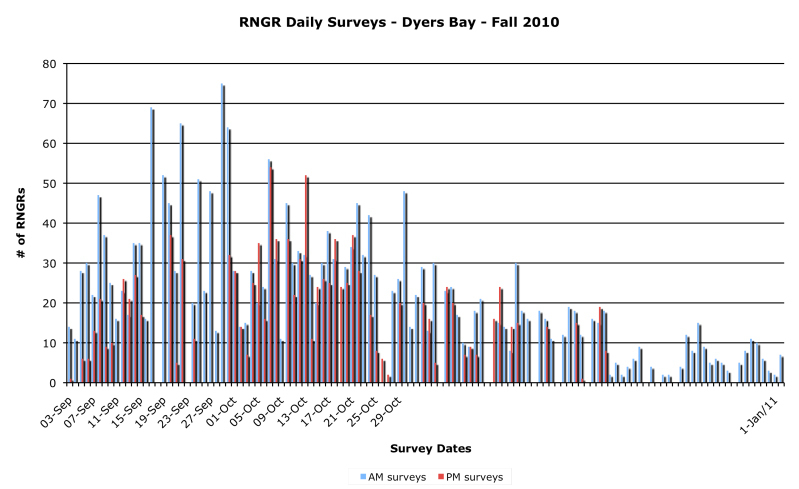 A total of 3,506 RNGRs were recorded for the fall survey period. In addition, 387 Horned Grebes (HOGR), 354 Common Loons (COLO), 640 Long-tailed Ducks (LTDU), and 1194 White-winged Scoters (WWSC) were observed. The ebb and flow of the fall migration of these species is clearly visible when charted (below). Consistently, more Red-necked grebes were seen in the morning than in the afternoon, again suggesting that RNGRs move into the area by morning and begin moving out of the area during the day. It may also be possible that the grebes use Dyers Bay for resting and foraging during the morning, and range further a field (i.e. out of the view of the observers) as the day progresses. Some of the day to day variation of the numbers of Red-necked grebes may be affected by the direction of the wind at Dyers Bay. Although the pattern is not a hard and fast one, when winds are favourable for migration, that is from the north, that RNGR numbers are lower. This suggests that the grebes fly past the area if they are able, or that they are induced to leave the area and continue migrating. When winds are less than favourable, that is generally from the south or at l ( east not from the north), the numbers of observed grebes ,tends to increase substantially. This is particularly noticeable with morning numbers. This emerging pattern will require additional study to clarify it.